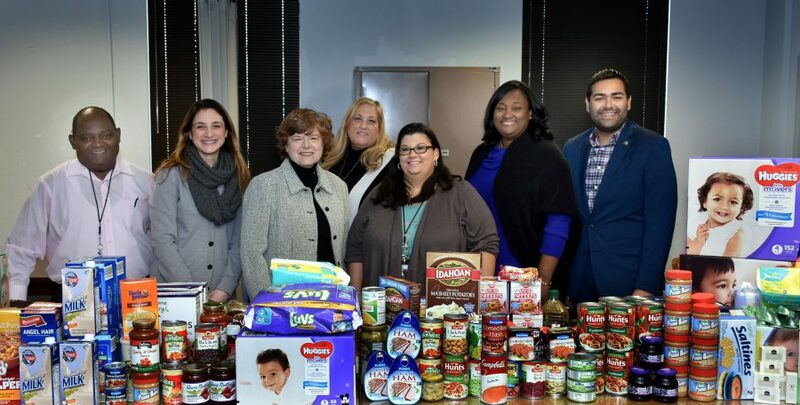 Freeholder Chair Bette Jane Kowalski, and Freeholders Kimberly Palmieri-Mouded and Sergio Granados today joined with Human Services Administrators and employees in Elizabeth as they gathered food, diapers and hygiene products to be distributed to federal employees impacted by the shutdown and also for residents of Union County that have applied for SNAP and need emergency assistance. The efforts are being organized through the Freeholder Board and through the Division of Social Services. l. to r. Division of Social Services Director Charles Gillon, Freeholder Kimberly Palmieri-Mouded, Freeholder Chair Bette Jane Kowalski, Division of Social Service employees Felice Twaddle and Tina Lopez, Human Services Director Debbie-Ann Anderson, and Freeholder Sergio Granados.